The temperature is rising up. It is time to put your feet in a pair of pretty sandals. What can look even better is a set of gorgeous toenails. Our promotions this time can take care of both your hands and your feet. 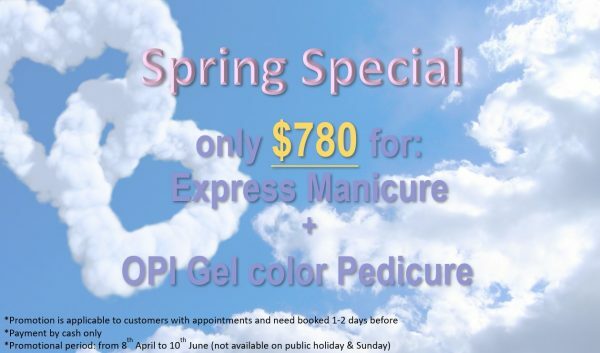 For $780, customers can enjoy both express manicure and soak-off Gel pedicure. This offer only lasts from 8th April to 10th June. Hurry, do not miss out! Make your booking now! The promotional price is valid for real nails only. If there is gel on the nail, and extra charge will be applied.